For those who still own a Super Famicom (or are planning to get one), good news! The console is getting a new cartridge this year. The Super Famicom is the Japanese version of the SNES. In 1995, a satellite modem peripheral called Satellaview was released in Japan (though it was later discontinued in 2000). Setallaview title Kaizou Choujin Shubibinman Zero, originally released in 1997, will be out on cart in 2017, marking the game’s 20 year anniversary. What makes this release so interesting is that it was originally a download-only title, apparently making this the first opportunity to own a physical version of this particular game. Only one title in the Kaizou Choujin Shubibinman series was ever released outside Japan: Shockman. Website RVGFanatic has a fascinating history behind the game (read here). 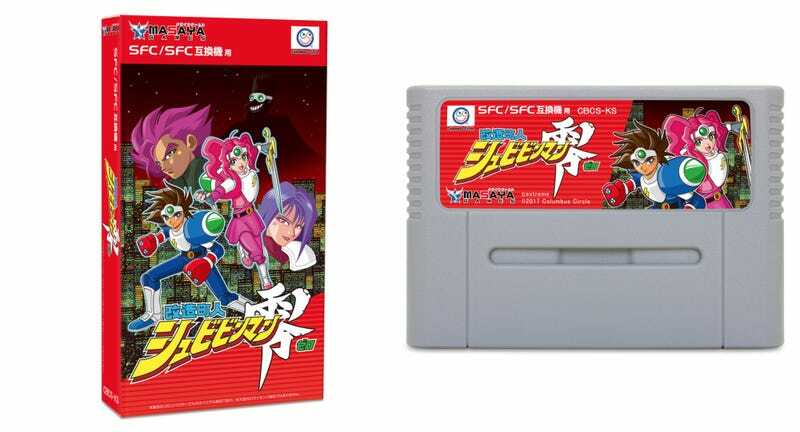 Priced at 6,998 yen (US$61.45), the package version of Kaizou Choujin Shubibinman Zero will be out in late June. According to 4Gamer, quantities are limited, and this release isn’t officially licensed by Nintendo.